Danny O’Brien is dreaming of AAMI Victoria Derby glory with Gravitational after the emerging stayer registered his maiden win yesterday at Seymour. O’Brien was excited to see him win, not only as it brought up a running double at Seymour, but also because of what might lie ahead. “It’s still early in the spring, but we’re laying the foundation for him to step up to 2000 (metres) and then hopefully the 2500 in November,” the Flemington trainer said. 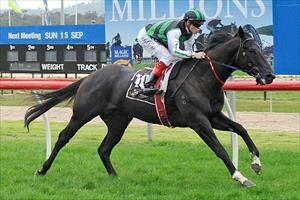 Super Cool won his maiden at Seymour in September last year before going on to run second in the Victoria Derby. Gravitational’s win followed that of Ravaged Heart in the $17,500 Height Insurance Agencies Maiden Plate (1113m), which was also carried out under Williams. The daughter of Show a Heart, who like Gravitational is owned by Sean Buckley, got home by three-quarters-of-a-length at her first visit to the races. The double kicked off what could be a big few days for O’Brien, Buckley and Williams, who will chase feature-race success with Shamus Award at Flemington this Saturday. The BECK Caulfield Guineas-bound colt, who split Cauthen and Long John at Moonee Valley on 24 August, renews hostilities with that duo in the $120,000 Listed Henry Bucks Best Dressed Stakes (1400m).